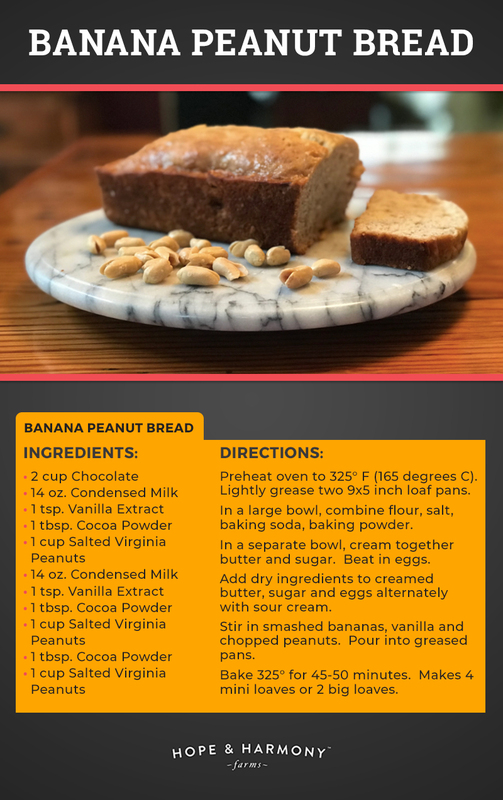 Banana nut bread is a staple of households all across the country, and for good reason! It’s easy to make, delicious, satisfying, and a great way to use up those bananas that are on the edge of going bad. My mom’s freezer was always stocked with the suspiciously colored banana, ready to be baked into banana bread at a moments notice. That’s the other great thing about banana bread; you can toss in just about anything you have lying around. Have some chocolate chips in the kitchen? Make banana chocolate chip bread! 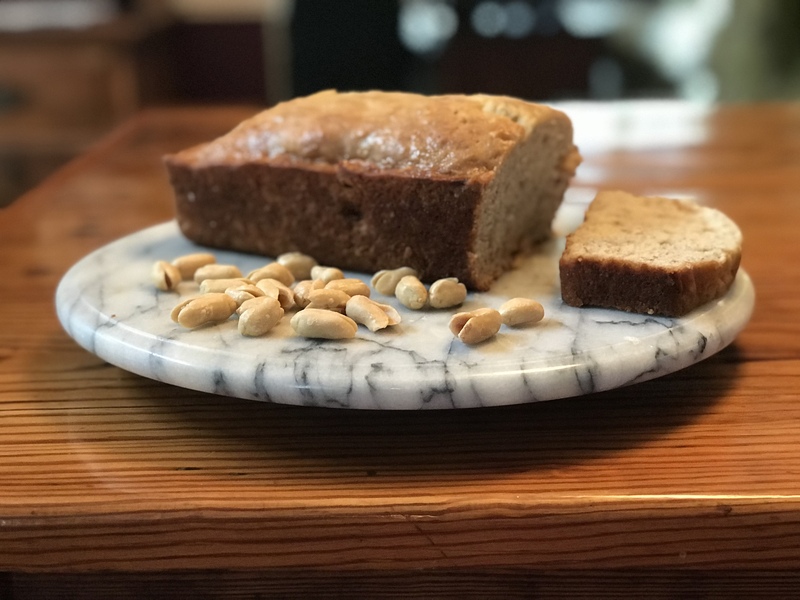 Banana nut bread is great for dessert, but it is also a classic breakfast- the hearty texture and added protein of the nuts make it a great way to start the day. Everyone has their own spin on the classic recipe, so of course here at Hope and Harmony we make it with our signature salted virginia peanuts. The salty sweet combo is to die for. The savory, buttery crunch of the virginia peanut meshes perfectly with the buttery smoothness of the banana bread. I could keep describing how good it is, but the only way to believe it is to try it yourself! Just be careful, once you make it with virginia peanuts, your family and friends will not stop asking you for it… Enjoy! Preheat oven to 325° F (165 degrees C). Lightly grease two 9x5 inch loaf pans. In a large bowl, combine flour, salt, baking soda, baking powder. In a separate bowl, cream together butter and sugar. Beat in eggs. Add dry ingredients to creamed butter, sugar and eggs alternately with sour cream. Stir in smashed bananas, vanilla and chopped peanuts. Pour into greased pans. Bake 325° for 45-50 minutes. Makes 4 mini loaves or 2 big loaves.